In the latest update of Silsila Badalte Rishton Ka 1st November 2018, Kunal finds to Mauli is not pregnant. 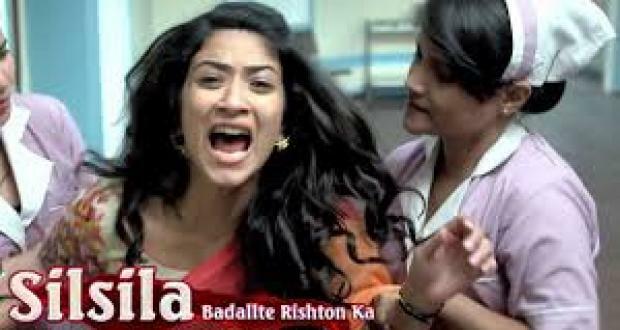 In today’s latest episode of Silsila Badalte Rishton Ka, is starts with Mauli watch a car to approach a young child on the road and runs to save his life. She falls on the floor along with the child. Kunal was in the balcony and was concerned but find that Mauli was fine. Dida’s will cautions about holding the weight echo in his mind, he wondered that why Mauli did not feels any discomfort after this situation. Mauli comes home where everyone was dancing and enjoying. He was concerned to Mauli that if she is fine then he said that he just wanted to saw her slip while saving a child. Amuli said that the child could have hurt. Kunal mentions that Mauli should have been hurt because she is pregnant as well. Mauli asks that of Kunal is suspicious. Mama takes to Mauli for little dancing. Nandini stood in front of the mirror, eyes filled with tears. She watches her henna filled within hands with Kunal’s name written in it. She dreams about Kunal that he draping her in red chunri, but soon realizes that the Kunal was not there. The next day, Kunal cames to meet Dr Asha she was the Mauli’s doctor. He asks her about Mauli’s pregnancy test reports. Dr Ashs said that Mauli took the reports herself and was as well reluctant to give the reports. Dr Asha said that she shifted the reports to her other clinic. Mauli was standing for Pooja and wonders that where did Kunal was gone. The flame on her platter goes off. Sweety claims that not to be a bad omen but Mamma assures that nothing happened, Mauli must light the flame again and continues her Pooja. Precap: Nandini was about to break her fast and looks through the sieve. Kunal comes in between. Nandini backs up and tells Kunal to go to Mauli. Kunal tolds Nandini that Mauli is not pregnant. khushboo is keenly interested in entertainment like TV Serials, movies etc. khushboo recently passed the 12th class, and now studying B.Com(prog). Now alloting the entertainment news at uptobrain. Khushboo was giving all update of entertainment news for our readers.